The young ginger cat was so skinny that almost every bone could be seen protruding from his body. He was heavily flea-infested while also showing burn marks from where he been left languishing in a cramped space. 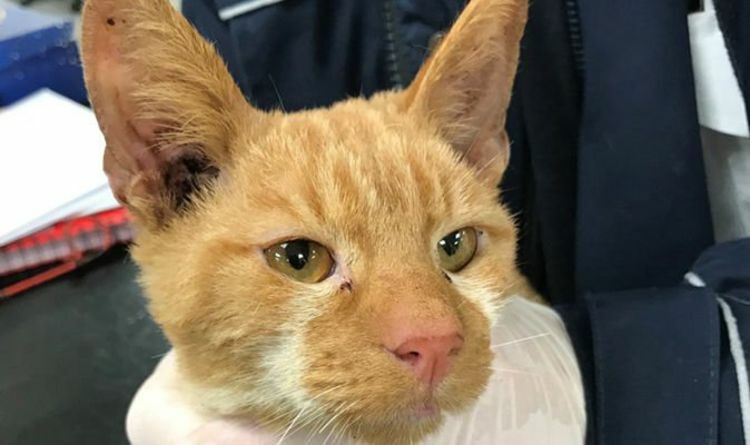 His suffering only came to an end when he was discovered dumped in a pet carrier next to communal rubbish bins and rushed to vets for urgent treatment. The tom cat, aged around three, has been dubbed the Ginger Ninja because of the way he loves his food and eats it so quickly. RSPCA animal cruelty investigators are now trying to find out how the cat was dumped in a filthy pet carrier in Wilton Street, Newcastle-under-Lyme, earlier this week. A member of the public fortunately found the animal and alerted the charity. Besides being badly emaciated, the cat had urine burns from laying in a confined space for long periods. RSPCA Animal Collection Officer Neil Astle rushed the cat to Hope Veterinary Surgery, in Trentham, for treatment and the pet is now making a good recovery. ACO Astle said today: “He was terribly thin and was left in a filthy pet carrier with no food or water. He was covered in fleas and was dirty but was so affectionate and friendly. “It is disgusting to think he was dumped and left like a piece of rubbish and I am appealing for help in finding the person responsible. The cat is still under veterinary care but putting on weight, largely because of his love of food, which he eats so quickly that he has earned the Ginger Ninja nickname. Senior vet Deb Wragg said: “He was in a poor state when he was brought to us and only weighed 2.4kg and he was also dehydrated. But he is eating everything we give him really quickly and is, thankfully, making great progress. Anyone with information about who dumped the cat should call the RSPCA appeals line on 0300 123 8018.